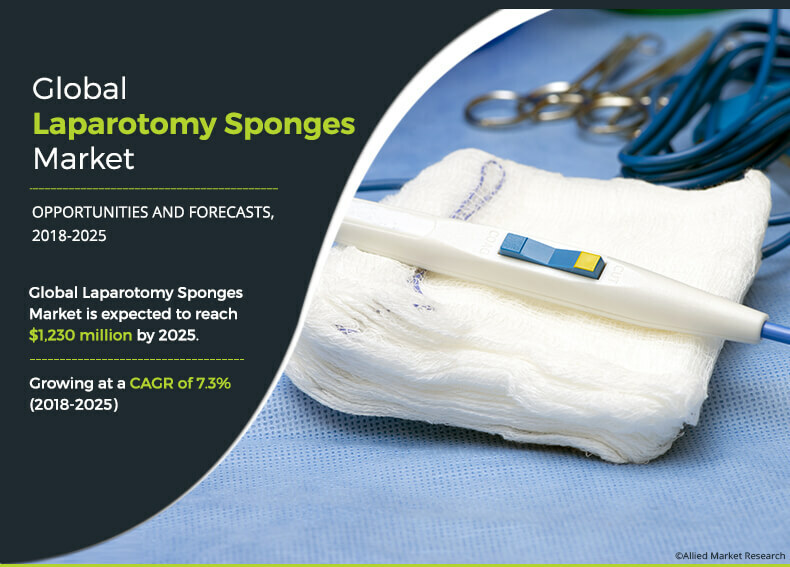 The global laparotomy sponges market was valued at $697 million in 2017, and is projected to reach $1,230 million, registering a CAGR of 7.3% from 2018 to 2025. Laparotomy is a medical procedure of abdominal surgery where a large incision is made to examine various abdominal organs such as stomach, intestine, and liver. This surgical operation is majorly carried out to examine the cause of abdominal problems such as bowel obstruction, bleeding in abdomen cavity, and bowel perforation. These surgeries involve the usage of absorbent pad known as laparotomy sponges, which are made up of cotton. They are utilized to absorb body fluids such as blood around the site of surgery, which in turn allows clear visuals of organs during surgeries. They are available in different sizes, depending upon the specific needs of the operating room technicians. The growth of the global laparotomy sponges market is majorly driven by increase in number of laparotomy surgeries carried out across the world. Other factors boosting the market growth include rise in prevalence of abdomen disorders, such as colon cancer, and upsurge in geriatric population. However, factors such as increase in demand for minimally invasive surgeries instead of invasive surgeries and side effects caused due to retained laparotomy sponges hamper the market growth. Conversely, the development of technologically advanced novel products by key vendors such as radio-frequency identification laparotomy sponges and high growth potential in the untapped emerging economies are expected to provide lucrative growth opportunities for the market. The global laparotomy sponges market is segmented based on product, sterility, end user, and region. On the basis of product, the market is categorized into radiopaque laparotomy sponges, traditional laparotomy sponges, and radio-frequency identification (RFID) laparotomy sponges. 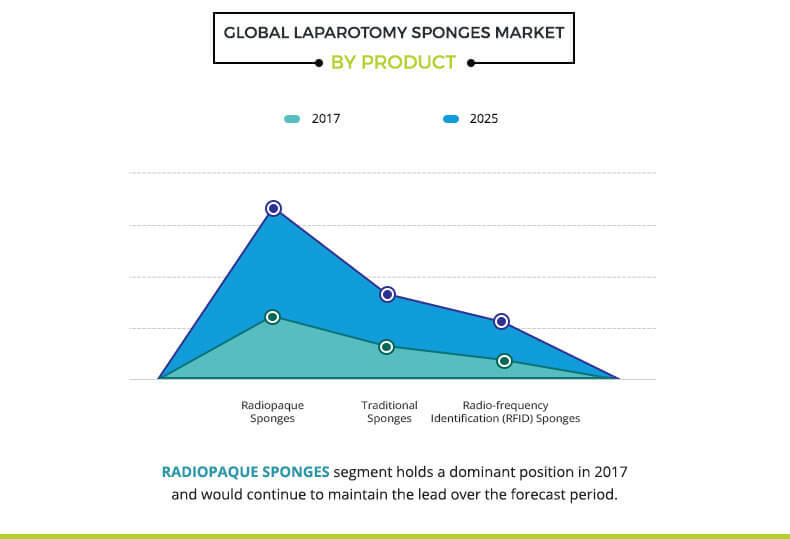 The radiopaque laparotomy sponges segment accounted for the largest market share in 2017, and is expected to continue this trend throughout the forecast period. On the other hand, radio-frequency identification (RFID) laparotomy sponges segment is anticipated to grow at a significant high CAGR during the forecast period. On the basis of sterility, the market is bifurcated into sterile and non-sterile laparotomy sponges. 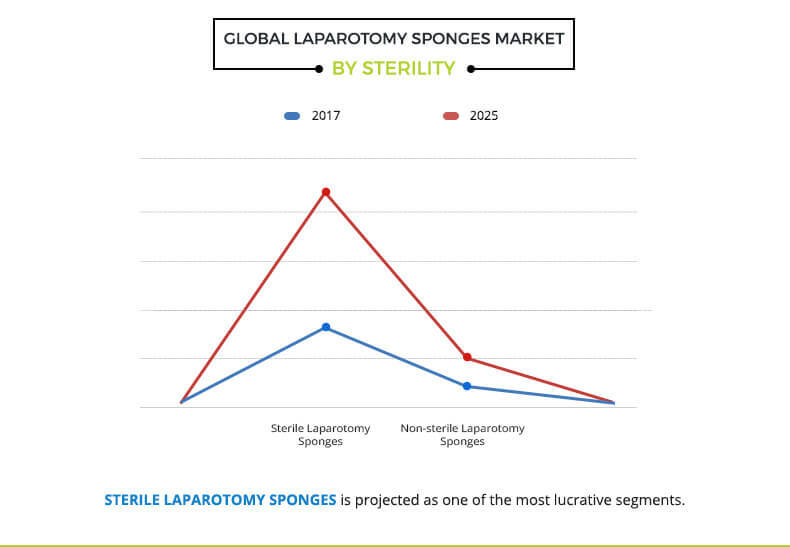 The sterile laparotomy sponges segment accounted for the largest market share in 2017, and is expected to register the highest growth rate during the forecast period. Depending on end user, the market is fragmented into hospitals and surgery centers. The hospitals segment held the largest share of the market in 2017, whereas the surgery centers segment is expected to register the highest growth rate in the near future. Region wise, the global market is studied across North America, Europe, Asia-Pacific, and LAMEA. North America held the largest share of the market in 2017, followed by Europe. On the other hand, Asia-Pacific is anticipated to dominate the market during the analysis period, owing to presence of high population base, increase in disposable income, and increase in patient awareness about laparotomy procedures. Asia is a large continent, and has emerged as an epicenter of abdomen disorders, which further fuels the growth of the market in this region. The key players operating in the global laparotomy market include Dynarex, Cardinal Health, Derma Sciences Inc., Medical Action Industries Inc., Stryker Corporation, ACTIMED, AllCare, BSN medical GmbH, DUKAL Corporation, and Haldor Advanced Technologies. Other players (these players are not profiled in the report, however, the same can be included on request) in the value chain include DeRoyal Industries, Hubei Qianjiang Kingphar Medical Material Co., Ltd., Yangzhou Super Union Import & Export Co., Ltd., and Patterson Companies. The study provides an in-depth analysis of the global laparotomy sponges market with current trends and future estimations from 2017 to 2025 to elucidate the imminent investment pockets. 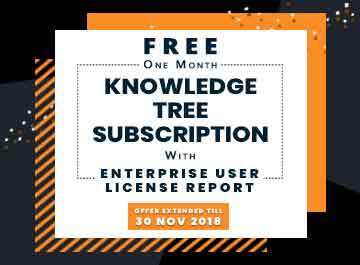 Identification of factors instrumental in changing the market scenario, rise in opportunities, and identification of key companies that can influence this market on a global & regional scale are provided. Key players are profiled, and their strategies are analyzed thoroughly to understand the competitive outlook of the market. Laparotomy sponges are surgical sponges, which are utilized to absorb body fluids and viscera during laparotomy surgical procedures, such as wound management, retraction, protection, and blunt dissection. These sponges are mostly made up of absorbable materials such as cotton or rayon. Moreover they are available in the form of sterile and non-sterile laparotomy sponges. Moreover, different types of laparotomy sponges are present in the market, including radiopaque, traditional, and radio-frequency identification (RFID) laparotomy sponges. Upsurge in prevalence of colorectal cancer worldwide is the major factor that drives the growth of the global laparotomy market. Other factors such as rise in cesarean births worldwide, surge in geriatric population, and easy affordability contribute toward the market growth. However, factors such as side effects caused due to retained surgical sponges in patient’s body and preference of laparoscopy surgeries over laparotomy surgeries impede the market growth. The use of laparotomy sponges is the highest in North America, owing to presence of majority of key players and development of advanced laparotomy sponges, followed by Europe and Asia-Pacific. 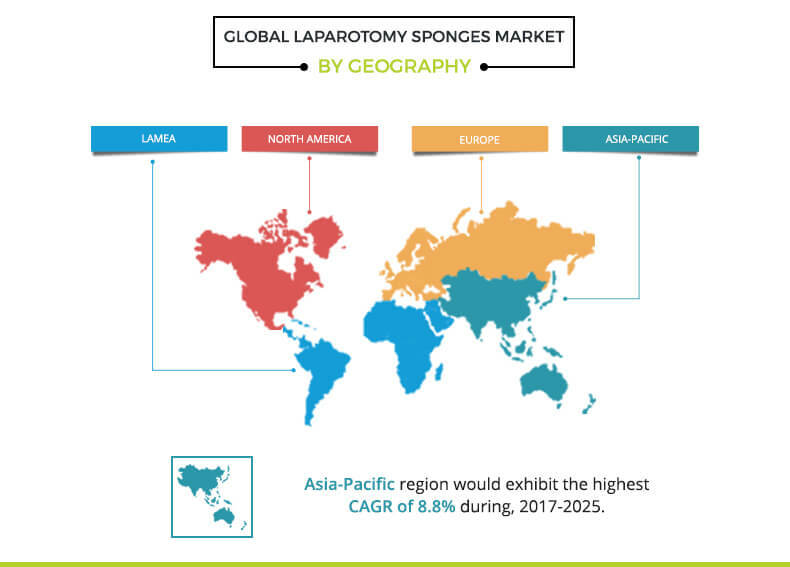 In addition, laparotomy sponge providers and distributors have focused on expanding their presence in the emerging economies such as India, Brazil, and Saudi Arabia, which in turn is anticipated to drive the market growth.